Growing in billowing drifts with breathtaking flowers, blue plumbago is an easy-care, showy shrub with cottage garden appeal. 'Imperial Blue' is the most popular cultivar, with butterfly-attracting blossoms in vibrant blue with a hint of violet. 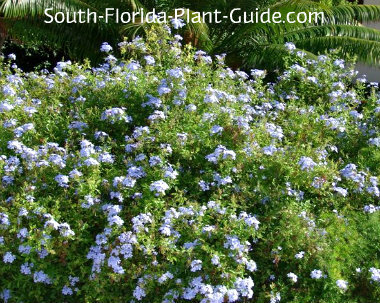 A blue flowering plant is a rarity in South Florida landscapes, and blue plumbago plays well with others, colorwise. It's especially nice combined with other plants with silvery foliage and those with pink, yellow or white flowers. There's even a lesser-known white plumbago. The flowers resemble those of phlox, and the petals are slightly sticky (like Post-It Notes). When trimming the plant - or brushing by it - expect to find little blue flower petals clinging to your skin or clothing. 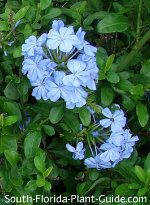 The plumbago plant has a spreading, rambling habit that works best in an informal, naturalized setting, cottage garden or English garden style landscape design. This evergreen shrub is a fast grower that blooms on and off all year - more in warmer weather. It needs full to part sun to flower to perfection. 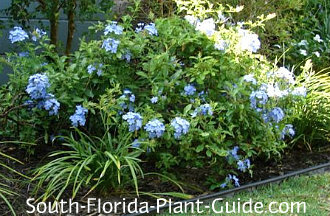 Blue plumbago is moderately drought-tolerant and it's cold hardy, growing anywhere in South Florida including Zone 9B. 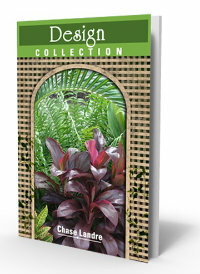 Keep the plant trimmed to 3 feet or less...it can grow much larger, but looks its best when kept in bounds. These shrubs are considered to be deer-resistant (though we make no promises). Add top soil or organic peat moss to the hole when you plant. You may also want to add composted cow manure to the mix to enrich the soil. Water regularly but give this shrub time to dry out between waterings. Trim occasionally for shape, size and to keep it looking tidy. Don't use hedge trimmers - this type of plant is not for neat freaks; it doesn't lend itself to a manicured landscape. Do a hard pruning in spring - late March or early April. Important: You MUST give plumbago a good drink before a hard prune. If you cut it dry it won't ever fully recover. Fertilize 3 times a year - in spring, summer and autumn - with a good granular fertilizer. You can supplement feedings with bone meal and/or liquid fertilizer to promote heavy bloom. Plant 3 feet apart. It's important to give the plumbago plant plenty of space...the rambling growth can overtake its neighbors unless the shrub is spaced properly to begin with. Plumbago looks fantastic cascading over the sides of a planter or container. Give it a regular drink but avoid overwatering. 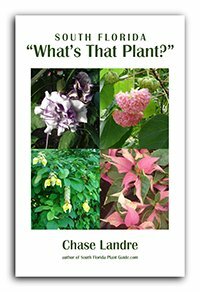 COMPANION PLANT SUGGESTIONS: Hibiscus, snowbush, silver buttonwood, Panama rose, Nora Grant ixora, bush allamanda, gold mound. Here's a paperback book just for you! Now also available as an ebook!